Hubby and I took a trip up to New York City back in early January and spent 3 days and 2 nights in the city. We stayed at Element by Westin which is near Times Square and is a modern eco-friendly hotel. We highly recommend that you check it out if you are looking for New York City accommodations that are modern, clean and super comfortable. The staff is fantastic! 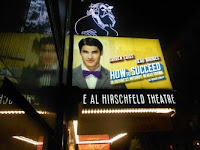 While visiting New York City we were determined to see a Broadway Show (we went to see "How to Succeed in Business without Really Trying") and we were also determined to walk down Broadway Avenue at night because we had always heard about how pretty it is with all of the signage and neon lights. 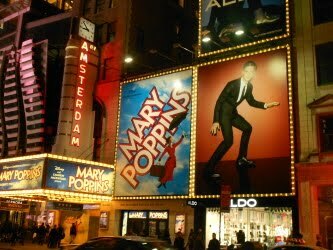 After we took in the show we decided to walk back to our hotel (about 6 1/2 blocks) and we were not disappointed with seeing all of the lights and sounds of Broadway! 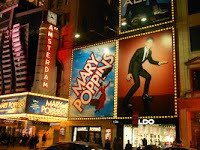 We had a great time just walking down the street and checking out all of the cool Broadway Show signs! Super fun! 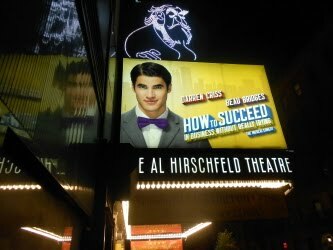 Both of the photographs in this post were taken of signs of currently playing Broadway Shows (as of January 2012). Aren't they cool looking? If you are ever visiting New York City...we highly suggest you take a walk down Broadway and check out all of the cool neon signs!